Today, November 1, the extension that ordered Colombia to mixed sobrearancel applied to imports of footwear and textiles, but in the Panamanian private sector is unknown whether the South American country will apply a new extension of the measure, which materialize would be the third in a year. This, apart from the World Trade Organization (WTO) ruled in favor of Panama twice in this trade dispute, which began in 2013 at the request of the isthmus. To add uncertainty to the outcome, the issue related sources confirmed that circulated a draft of what would be a new decree of Colombia in recent weeks, but it is unknown whether this is an official document. A spokesman for the Ministry of Commerce, Industry and Tourism of Colombia told this newspaper that the institution would not rule on the trade dispute. “For us it is clear that it is illegal and must be dismantled and allow free trade,” said Surse Pierpoint, general manager of the Colon Free Zone (CFZ), which has been the most affected in the country by this Colombian measure. “Those who are still losing Colombian consumers and the CFZ to blur the case,” he said. ZLC figures show that the impact of trade sobrearancel mixed commercial premises exceeded $ 450 million between 2013 and 2015. Amid speculation about this alleged Colombian draft is the final verdict of the dispute by the arbitrator appointed by the WTO, Giorgio Sacerdoti. The Italian will decide whether Colombia should remove the mixed tariff immediately, or if you will be given a reasonable time to do so. The Ministry of Commerce and Industries (MICI) of Panama Sacerdoti expected to present its final report to the dispute in the first half of November. That is, days after the mixed sobrearancel has lost validity, according to Decree 1229 of 29 July 2016 of Colombia, signed by Finance Minister Mauricio Cardenas, and the Minister of Industry and Commerce, Maria Claudia Lacouture. Since the WTO ratified last June 7 the original ruling in favor of Panama, deputy ministers and trade ministers of both countries met in search of a mechanism for Colombia dismantle the measure. However, these meetings have not borne fruit. The lack of consensus between the two countries and Colombia’s position not to abide by the WTO ruling made all eyes to focus on the meeting between the presidents of Panama and Colombia, Juan Carlos Varela and Juan Manuel Santos, respectively, last October 25 in Metetí, Darien. However, neither they broached the subject of trade dispute and instructed their commercial institutions the task of finding a joint solution in this respect. In this regard, the head of MTI, Augusto Arosemena said that “we are working on finding solutions.” But there was no response to the query of whether he informed whether or not to extend the term of the mixed sobrearancel. Or if you abide by the two rulings of the WTO favorable to Panama and dismantle the measure. 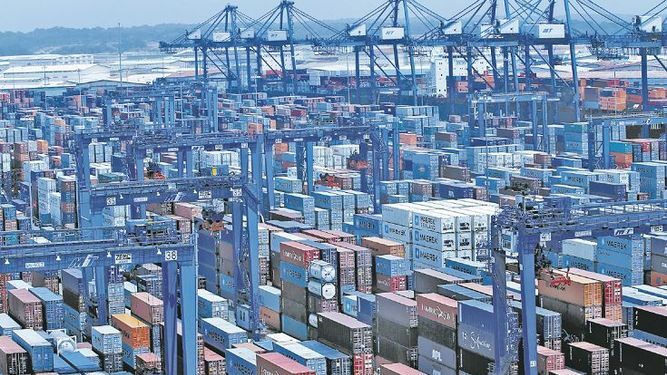 MITI has demanded on several occasions that the mixed sobrearancel be dismantled immediately; its counterpart insists that the measure makes it against smuggling and money laundering, and it appeals to the WTO to establish a deadline for their removal.